WE HEAR THE LIONS before we see them. Peculiar grunts, more vibration than sound, reverberate through the forest. It is a sudden, muffled roar that makes all four of us sit up in our open-top jeep. 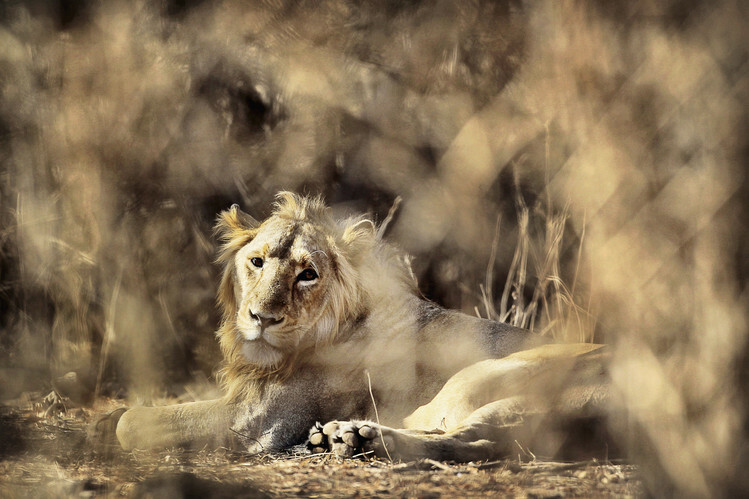 A rare Asiatic lion, found only in India, is tantalizingly close. The vehicle lurches over the dirt road toward thickets of teak and sandalwood trees, then rolls onto a smaller trail and aims for a clearing. And then we see her. About 40 feet away, a tawny lioness rests next to a tree, propped up on her elbows. She swivels her head, seeming relaxed in the presence of tourists clicking cameras. It is eight in the morning and the sunlight filtering through the tree tops casts her in a golden glow. This sight alone is enough to make us thank the wildlife-viewing gods. But there is more: A pair of cubs, whom our guide estimates to be three months old, with a nimbus of fuzz around their ears, emerges from the trees. They tussle like oversize kittens above the leaves littering the forest floor, then trot off together. We spot two more young lions, about six months old, bearing the scraggly beginnings of manes. They are adolescently aloof, with their backs turned toward us. About 20 feet deeper into the forest, a group of adult lions picks over breakfast leftovers—a barrel-size rib cage with some crimson shreds that not so long ago was a buffalo. Centuries ago thousands of Asiatic lions roamed across Syria, Iraq, Iran, Pakistan and India. They were hunted to the brink of extinction. Today 411 wild Asiatic lions are believed to be left in the world. Gujarat state in northwest India is their last and only natural habitat. Most of them are to be found in Gir Forest National Park, where a friend and I came for a three-day weekend focused on glimpsing these rare and elusive creatures. Asiatic lions (panthera leo persica) are smaller than their African counterparts (panthera leo leo), and Asiatic male lions have less voluminous manes. These lions typically grow tufts of hair at their elbows, sport long tail tassels and have a fold of skin along their bellies. Watching from the clearing, with the lions mere steps away, I see they are plenty big; male adults can weigh as much as 420 pounds. India may be known for its urban mayhem, but it also boasts more than 100 national parks encompassing large swaths of pristine land. The wildlife sanctuaries aren’t without their shortcomings, but in general they are overlooked gems in India where, with luck, one can spot wild rhinoceri, elephants, tigers as well as lions. 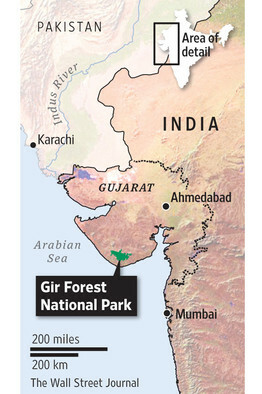 Spanning 100 square miles in Gujarat, Gir Forest National Park is less than one-thirtieth the size of Yellowstone National Park. The park’s tranquil forest and dirt roads are disrupted by the loud, gas-guzzling jeeps that tourists are required to ride around in. When you come within leaping distance of a lioness lounging among the trees, you forget about these nuisances—as is the case when we spy the cluster of young lions and breakfasting adults. Our guide, a slight 47-year-old local named Jankan who calls to mind an elf in his green safari vest and trousers, brims with excitement. He crows that he hasn’t seen a pride of this size in five years. Driving off the road is illegal. But this being India, no one seems to care, including the forest ranger who is directing the queue of tourist-filled trucks waiting to view the pride. There is a small fire burning among a tinderbox of surrounding sun-weary trees, presumably built by a ranger in the predawn cold. An Australian tourist later remarks that such a fire would warrant a fine of thousands of dollars back home. India’s lions are lesser known than its famed tigers, which live on dozens of tiger reserves and are fighting a well-publicized battle against poachers. Even many Indians are surprised to hear that wild lions live in their country. These lions entered the Asian subcontinent around 6,000 B.C., roaming across northern and central India. While their numbers have dwindled, their legacy remains: India’s emblem is three lions perched on a pedestal, and the ubiquitous Indian surname Singh is a variation of the Sanskrit word for lion. By 1913, a mere 20 lions remained in Gujarat. The royal ruler the Nawab of Junagadh, the princely state near Gir Forest, invited Lord Curzon, the viceroy of India, to hunt lions with him. Lore has it that Lord Curzon refused and persuaded the Nawab of Junagadh to ban lion hunting. In 1911, a reserve called Sinh Sadan or “abode of the lion” was established in Gujarat; it became Gir sanctuary, in 1965. This was no guarantee of survival. General neglect within Gir resulted in many careless deaths. Lions drowned in open wells or were downed by electric fences. Twelve lions were killed between 1984 and 1995 by trains running on the rail line that cuts across the park. 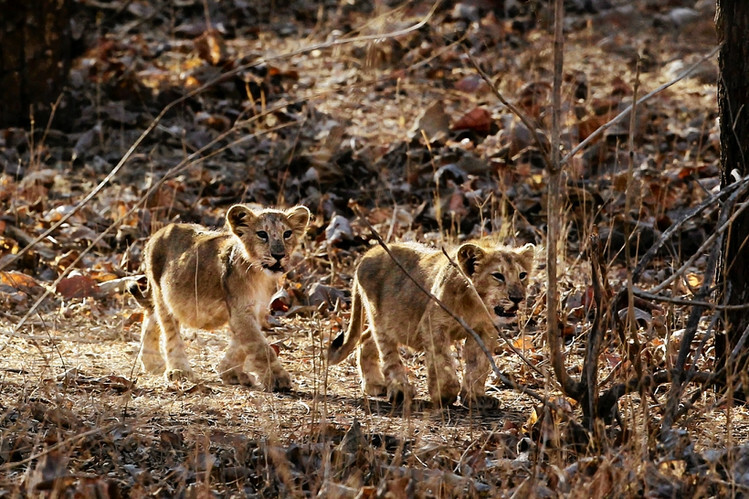 Their situation has improved, and Gir’s lion population has grown from 359 in 2005 to 411 in 2010. Other wildlife has also flourished in Gir. After admiring the lion pride, we crisscross the park’s dirt roads, passing birds (there are 300 bird species in Gir), langur monkeys with whip-like tails and docile chital (Bambi-esque spotted deer). Suddenly our guide yelps and points frantically. “You see? Leopard!” he shouts, grabbing our driver. We peer into the woods and see only trees, leaves and more trees—no sign of the famously elusive and skittish leopard. Getting There: A flight from New York to Mumbai takes about 14 hours. There are direct flights from Mumbai to the airport in Rajkot, in Gujarat state. 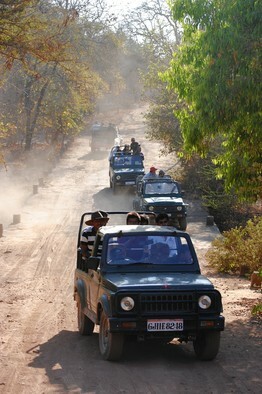 The drive to Gir Forest National Park is two and a half hours. Your hotel can book a taxi. Looking for Lions: Three-hour safaris leave from the visitors’ center three times a day (the 6 a.m. session is best for spotting wildlife). Book in advance, as a limited number of jeeps are allowed into the park each day. The permit costs $45 per jeep (it seats up to six passengers). Hiring the vehicle and required driver costs $22 for each safari. The guide fee is $3 and the still-camera fee is $9. When to Go: Gir National Park is open from October through mid-June, but it can be uncomfortably hot by mid-April. Where to Stay: There are many guesthouses within a few miles of the park entrance. Maneland Jungle Lodge has basic but clean rooms with hot showers. Their small bungalows (from about $77 a night, including vegetarian meals, maneland.com ), located in a garden-like setting, were more inviting than the concrete hotels along the main road. Other Things to Do: The Gir Interpretation Zone, a 412-hectare fenced-in habitat with lions, deer and other wildlife, is about a 30-minute drive from the park. It was designed to reduce the number of tourists in the park itself. Visitors view the habitat on a 45-minute bus ride. Entrance fee is $23. Contact the Forest Department at Gir Forest Park (91-028-7728-5541). “You see?” Jankan yells again. No, we reply, shaking our heads. “D’oh!” he exclaims and smacks his forehead, à la Homer Simpson. We forge on and drive past a few huts on a hillside. Incredibly enough, thousands of indigenous Maldhari herders live within Gir forest amid not only lions but also hundreds of leopards. I watch a father lift a small child, forming a dark silhouette against the bright sun. I ask Jankan whether this is dangerous. “No! They are vegetarian. Very nice!” he replies. I am puzzled until I realize he thinks I asked whether the locals are dangerous, rather than the lions living near children. 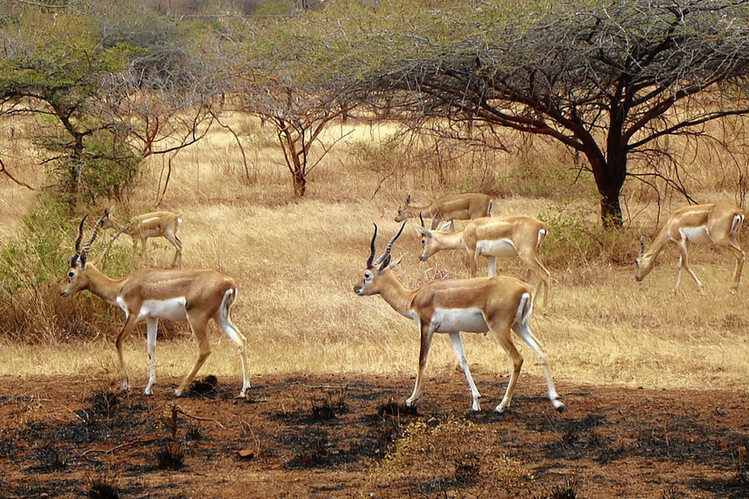 Since the 19th century, Gir Forest has lost 45% of its area to farming, wood cutting and human settlements. 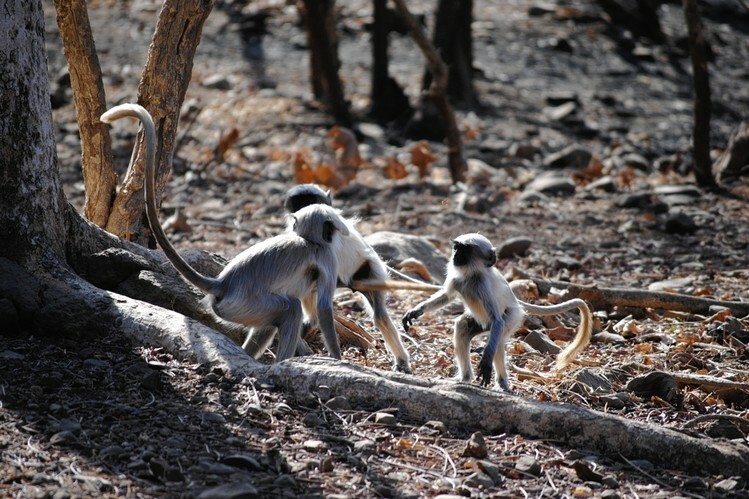 More than 54 Maldhari settlements and 97 villages are within a three-mile radius of Gir. People gather wood or graze livestock in the lion’s abode. It’s no wonder that clashes arise between villagers and big cats. Swelling human populations mean deforestation and loss of habitat for the chital deer, which are the lions’ primary prey. Later in the day, our second foray into the park is also fruitful. Though it is after five in the evening, the sun is still a hot disc in the sky. Jeeps churn up clouds of dust as they line up on the road in a telltale sign that a lion has been spotted. We follow the traffic, then wait our turn to roll off the road and dip 100 feet into the forest. At first all I see is a forest ranger standing on a flat ridge of rock. Then he bangs a walking stick on the rock and a piece of the brown landscape moves. A large male lion napping on the rock near a tree picks up his maned head, glares at us, then flops back down. The ranger clearly isn’t heeding the words on the signs at the visitor center warning people not to disturb the wildlife. Lucky for him, the king of the forest is more concerned with napping than he is with snacking.